This is my loyalty commitment to Bah! Humbug! If you haven't found their challenge blog click on the link and check it out, if you participate regularly you'll have lots of Christmas cards ready to send out when the season starts and not find yourself scrambling. Novel concept, huh? Supplies: White Card Blank 5" X 6 1/2" Halcraft, Papers: Stampin Up- Whisper White, all others left over papers from Christmas paper stash, Stamp: Recollections(Michael's)-Merry Merry, Ink: Stampin Up-Ruby Red, Coluzzle Shape cutter template-oval, Sakura Gelly Roll pen- red star, Michael Richards glitter dome stickers, American Crafts Elements-ribbon, pop dots. Thanks for sharing your card with us at Bah! Humbug! Beverley. Sometimes the real world gets in the way of creating but we really appreciate your loyalty to our challenges. Your 2010 card box must be looking quite healthy now. oh Beverly this is just gorgeous - what a fab layout. Off to look at your other stunning creations while I'm here. 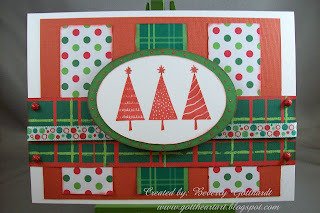 Great Christmas card and I am sure regreting not being able to find the time to participate in this challenge too--I'm gonna be real jealous in December when all your cards are done and mine aren't started LOL! I love it when Christmas trees are stamped in colors other than green ;-) Great thinking outside the box!